The practical training is the important component in training a doctor and pharmacist. The knowledge and skills, acquired during study at clinical and theoretical departments, are consolidated by the students during practical training, which is held in winter and in summer. The bases of practical training are over 200 most powerful medical preventive establishments in c. Kyiv, Stomatological medical center at O.O. Bogomolets National medical university, 10 sanitary epidemic stations, 4 pharmaceutical plants, 7 pharmaceutical unions with tens of pharmacy stocks. About five thousands students in average pass through the practical raining every year. The practice is managed by more than 280 experienced teachers of the university, which have the higher medical category and employees from practical health care with the corresponding qualifications – at training bases. The organization of practical training is the complex mechanism, which includes the work on selection of training bases, submission of the corresponding documents in order to execute the orders for Chief administration of health care in c. Kyiv, pharmaceutical unions and city sanitary epidemiological service about distribution of students and teachers among practical training bases, establishment of orders on practical training for the University, provision of teachers and students with the corresponding accompanying and methodical materials, taking the differentiated credit on practical training, liquidation of failed exams if a student did not pass through the whole practical training or its certain cycles due to valid reason. It is necessary to organize and to carry out the medical examinations of students and bacteriological examination for students to receive the access to practical training at medical establishments with special antiepidemic mode (maternity hospitals and departments, surgical hospitals). The dean’s office on practical training carries out the appropriate work on support of contacts with practical health care establishments in different regions of Ukraine, Chief administration of health care in c. Kyiv, management of pharmaceutical unions and plants in order to provide with timely practical training and to receive the operative information directly from training bases. The corresponding documents, in particular the lists of students and practical training program is sent during the established period, as a rule not later than 1 month until start of training, to the chief doctors and directors of the establishments, which are the practical training bases. The dean’s office organizes the acquaintance of training supervisors with training bases during ten days until start of training. The site meetings about procedure and peculiarities for fulfillment of practical training at present moment, running current and reporting documentation are held with students’ activists and teachers, sent to manage the training. 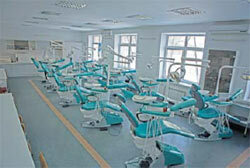 The students-foreigners, representatives of fifty seven countries, also pass through practical training. The experienced teachers, who fluently speak English and know the medical terminology in English, are assigned to manage the practical training of the students with English speaking study form. The dean’s office on practical training performs the control for fulfillment of training, and after its finish – for taking the differentiated credit and liquidation of failed exams. Thanks to annual practical training, which starts since the first year of study, at senior courses the students already have such experience of practical work, which allows them orienting in clinical situations, in establishment of correct diagnosis, prescription of the corresponding treatment, rendering the first aid, making the medicines due to the individual prescription, knowledge of clinical pharmacy, chemist’s and industrial technology for production of drugs. The practical training helps the students to adapt to the future working place, impart practical skills in the collective, performance of rules and ethics and deontology. Peculiarities of practical training at medical faculties due to specialties “medical care”, “pediatrics”, “medical preventive care”. The practical training at the 2 nd and 3 rd courses is the component in organization of teaching process due to the credit modular system and is held as an individual module within spring-summer semester. At the second course the students of medical faculties pass through practical training on care for patients (5 credits, 150 hours) during IV semester and in-patient departments of therapeutic, surgical and pediatric specialization at clinical bases of department. The students consolidate the skills and abilities on care for adult patients and children within the duties of junior medical nurse. At the third course the students pass through practical training of medical nurses (4 credits, 120 hours) during VI semester at in-patient departments of therapeutic, surgical and pediatric specialization at clinical bases of department. The students consolidate their skills and abilities within professional duties of middle medical staff, including mastering the technology on fulfillment of subcutaneous, intramuscular and intravascular stream and drop-by-drop introduction of drugs. The important aspect of the work is devoted to mastery of methods on rendering first care to adult patients and children. 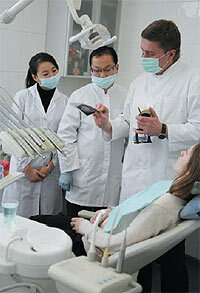 The practical training at the 4 th and 5 th courses of medical faculties is organized since 2010. Such training is held in summer during 4 weeks (6 credits, 180 hours) at medical practical health care establishments in c. Kyiv. The students, who come from other cities and villages of Ukraine, if the corresponding documents are available, are provided with the possibility to pass through practical training at health care establishments at the place for residence of their parents. All kinds of practical training are provided by the appropriate methodical materials, curriculum, list of practical skills, examples to run dairies, etc. The curricula for specialists in “stomatology”, approved by the Orders from MHC of Ukraine, anticipate 210 hours (7 credits) at the 2 nd and 3 rd courses, 288 hours – at the 4 th course and 108 hours – at the 5 th course for practical training. After the second course the students of stomatological faculty pass through practical training, consolidating the skills and abilities on care for patients at therapeutic/surgical and stomatological departments within the duties of junior medical staff and medical nurse. Starting since the third course, the students of stomatological faculty pass through medical practical training: after the third course – on therapeutic stomatology and prevention of dental diseases, after the fourth course – on therapeutic, surgical and orthopedic stomatology; at the fifth course the students pass through practical training on children’s stomatology, which consists of cycles of therapeutic, surgical stomatology and orthodontology. The practical training is held by highly skilled teachers (more than fifty persons), doctors of the first and high category at clinical bases, which are located in more than forty health care establishments in c. Kyiv. Peculiarities of practical training for students at medical psychological faculty. The students of medical psychological faculty pass through practical training due to curricula for training the specialists, approved by MHC of Ukraine, in summer after the second, third, fourth and fifths courses. The practical training is managed by two specialists at the same time: one – with clinical specialization, the second one – medical psychologist. In total amount of hours 40% from practical training is assigned to psychological aspects in the work of future medical psychologist. After the second course the students of medical psychological faculty consolidate the skills on care and psychological observation for patients (135 hours, 4.5 credits; per one week at therapeutic, surgical and pediatric departments of in-patient hospital). After the third course the students pass through practical training of medical nurses using the skills on psychological diagnostics and psychological training (135 hours, 4.5 credits, 3 weeks). They work at therapeutic, surgical, maternity and children’s departments of in-patient hospital, performing the duties of medical nurse. After the fourth course the students of medical psychological faculty pass through medical practical training and psychological consulting and psychological correction (135 hours, 4.5 credits, three weeks); after the fifth course – medical general clinical training and medical psychology, psychiatry (180 hours, 6 credits, 4 weeks). Due to curriculum of 2011 at the sixth course in winter the students pass through medical practical training on medical psychology (2 weeks at in-patient psychiatric facility, dispensary and at medical psychological center), based on 40% from practical training to medical psychology. Highly skilled teachers from medical university, at places – doctors of the first and high category are involved into practical training. The practical training on care for patients, practical training of medical nurse and medical practical training of students at medical psychological faculty is held at the bases of in-patients hospitals and polyclinics in c. Kyiv under supervision of teachers-specialists with appropriate specialization, as well as at specialized establishments that render the psychological and psychiatric care, under supervision of psychology and pedagogy departments and at the places – under supervision of doctors. Peculiarities of practical training for students at pharmaceutical faculty. 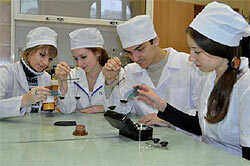 Due to the orders from MHC of Ukraine, the practical training of students at pharmaceutical faculty is held within 1,134 hours (31.5 credits), among them 378 hours are assigned to the independent work of students beyond classes: after the first course – academic propedeutic training of chemist’s technology of drugs, introductory training on organization and economy of pharmacy (per 54 hours, 1.5 credits); after the second course – academic trainings – field training on medical botany (108 hours, three credits) and introductory medical training (54 hours, 1.5 credits); after the third course – academic training on pharmacognosy (108 hours, 3 credits); after the fourth course – academic training on industrial technology of drugs (54 hours, 1.5 credits) and practical training – on chemist’s technology of drugs (162 hours, 4.5 credits); after the fifth course – academic training on clinical pharmacy (54 hours, 1.5 credits) and practical training – on pharmaceutical chemistry (162 hours, 4.5 credits), organization and economy of pharmacy (162 hours, 1.5 credits), on management and marketing of pharmacy (108 hours, 3 credits), as well as specialization (54 hours, 1.5 credits). The practical training is held under supervision of more than forty highly skilled teachers from medical university, at places – under supervision of doctors and pharmacists, at bases of specialized pharmaceutical institutions, botanic gardens, hospitals (more than 25 pharmacies, 9 pharmaceutical enterprises and plants, 2 botanic gardens, 2 hospitals).